The Interaction Hub (iHub), formerly known as the Enterprise Portal, has come with a branding engine since the first release. The engine allows you to configure the look and feel of your site. It is one of the tools we use to make beautiful sites that have a unique look for your organization. With the release of PeopleTools 8.54, and the new Fluid UI, a new branding engine is being deployed and delivered within PeopleTools. The old Portal/iHub branding engine is now considered deprecated as of the release of Interaction Hub 9.1r3. That means no more updates are coming and it will soon be removed. Clients are being encouraged to adopt the new branding engine, which as come as quite a surprise to many. Update Re: PeopleTools 8.55: The new branding engine does not govern the Fluid experience. Changing the brand of the Fluid experience requires a very different technique and has limits. Contact us and we can help take you through your options. The engine is entirely different as PeopleSoft adapts to an HTML 5 standard. There are no longer concepts such as binds, bars, and layouts. There are new considerations such as Fluid compatibility and mobile. The concepts and terminology are not only different, the tools to build the brand are completely new. Since this branding engine is now implemented in PeopleTools, a new PeopleTools 8.54 brand can be easily shared across all of your PeopleSoft applications. 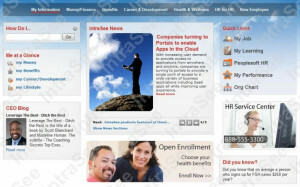 Customers will have to plan to rebuild their site branding after a PeopleTools 8.54 and Interaction Hub 9.1r3 upgrade. This is also a great opportunity to look at your design and freshen it up. Because branding is such an essential component to the user experience, it is one of IntraSee’s core strengths. Contact us today and learn how IntraSee can help you redesign your brand and reimplement it using 8.54’s branding engine.